Cataracts are a common age-related vision problem that involves clouding of the lens in the eye. Cataracts are responsible for about one half of the world's blindness. Developing countries bear the brunt of blindness caused by cataract, due to higher incidence, lower age at onset, and less access to eye care compared to developed countries. In the United States, about 22 million people age 40 and older have cataracts. The older a person gets, the greater the risk of developing cataracts. Women are more likely to develop cataracts than men, and African Americans and Hispanic Americans are particularly at high risk. Cataracts never go away on their own, but some stop progressing after a certain point. If cataracts continue to progress, they can cause blindness if left untreated. Fortunately, cataracts can almost always be successfully treated with surgery. Millions of cataract operations are performed each year in the United States, and there is a very low risk for complications. However, before opting for surgery, people need to consider on an individual basis how severely a cataract interferes with their quality of life. Cataract surgery is rarely an emergency, so people have time to consult with their doctors and carefully consider the risks and benefits of surgery. Surgery involves removing the cataract and replacing the abnormal lens with a permanent implant called an intraocular lens (IOL). The operation is generally painless, takes less than 1 hour and is performed on an outpatient basis. Most people remain awake, but sedated, during the procedure. If you have cataracts in both eyes, doctors recommend waiting at least 1 to 2 weeks between surgeries. 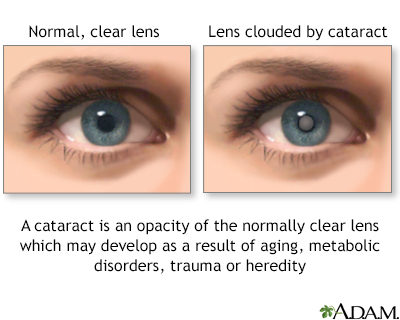 A cataract is an opacity, or clouding, of the lens of the eye. The lens is normally clear. If the lens becomes cloudy or is opacified, it is called a cataract. The lens is an elliptical structure that sits behind the pupil and is normally transparent. The function of the lens is to focus light rays from objects in front of the eye, forming mirror images that are projected onto the retina (the light-sensitive tissue at the back of the eye). In younger people, the lens is elastic and changes shape easily, allowing the eyes to focus clearly on both near and distant objects. As people reach their mid-40s, biochemical changes occur in the proteins within the lens, causing them to harden and lose elasticity. This loss of elasticity causes presbyopia, a type of vision problem that makes it more difficult to focus on close objects. This creates the need for reading glasses in almost everyone as they age. At this same stage there can be other changes in the lens that can affect the vision, but don't have much effect on the ability to read the eye chart. These changes include reduced ability to see in dim light, or sensitivity to glare. When considered together, these changes, including presbyopia, are called "dysfunctional lens syndrome". Cataracts develop when proteins in the lens clump together, forming cloudy (opaque) areas. The lens can also change color from transparent to a yellowish or brownish tint, which further worsens visual sharpness. Depending on how dense they are and where they are located, these cloudy areas can block the passage of light through the lens and interfere with the formation of images on the retina, causing vision to become cloudy. Age-related cataracts usually develop slowly over several years. 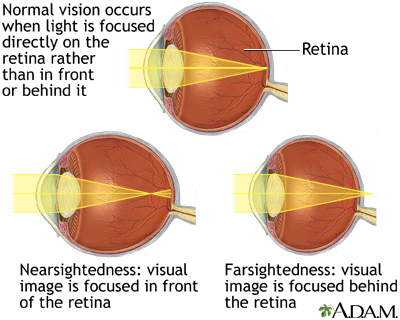 With cataracts due to other causes, loss of vision may progress rapidly. Some cataracts stop progressing after a certain point, but they never go away on their own. If extensive and progressive cataracts are left untreated they can cause blindness. In fact, cataracts are the leading cause of blindness among adults age 55 and older. Fortunately, cataracts can nearly always be successfully removed with surgery, greatly improving vision. Form in the nucleus (the center) of the lens. This is the most common type of cataract associated with the aging process. Nuclear cataracts increase nearsightedness and may initially improve close-up reading vision. As the cataract progresses, the lens color may darken, making it more difficult to distinguish colors and see clearly. First form in the cortex (the outer edges of the lens) and then progress inwards to the center of the eye. They have a striped or spoke-like appearance. This type of cataracts can cause glare and also affect night vision and the ability to see contrast. Form toward the back of the capsule that surrounds the lens. They can cause glare or halos and tend to affect near vision more than distance vision. Aging is the most common cause of cataracts. Cumulative effects of exposure to sunlight, irradiation, toxins, drugs, and disease cause the mofication of proteins in the lens that makes them clump together. One of the causes of lens protein modifications is oxidative stress. Oxygen-free radicals (also called oxidants) are molecules produced by natural chemical processes in the body. Toxins, smoking, ultraviolet radiation, infections, and other factors can create reactions that produce excessive amounts of oxygen-free radicals. When oxidants are overproduced, these chemicals can be very harmful to cells throughout the body. Protective antioxidants, such as glutathione, help fight oxidants. Cataract formation is one of many damaging changes that can occur from overproduction of oxidants, possibly in combination with deficiencies of glutathione. One theory is that in the aging eye, barriers develop that prevent glutathione and other protective antioxidants from reaching the nucleus in the lens, thus making it vulnerable to oxidation. Long-term use of oral corticosteroids (steroids) is a well-known cause of cataracts. It is unclear whether inhaled and nasal-spray steroids increase the risk for cataracts. Several studies have linked statin drugs (used for cholesterol treatment) to an increased risk for cataracts. Other types of medications can also increase the risk for cataract development. Medical conditions that increase the risk for cataracts include diabetes, high blood pressure, obesity, and skin conditions such as atopic dermatitis (a type of eczema). Medical conditions that require long-term use of oral steroids are associated with secondary cataracts. Eye Conditions and Eye Surgery. The inflammatory eye condition known as uveitis is strongly associated with cataracts. Glaucoma does not increase the risk for cataracts but certain types of surgery (trabeculectomy) and medications (miotics) used to treat glaucoma do increase cataract risk. Other types of eye surgery associated with cataract development are vitrectomy and peripheral iridectomy. Cataracts can develop from overexposure to radiation, including sunlight. A common cause of radiation cataracts is the ionizing radiation used during treatment for head and neck cancer. Cataracts are also a side effect of total body radiation treatments, which are administered for certain cancers. Traumatic cataracts are caused by blunt or penetrating injury to the eye. This type of cataract can develop immediately after the injury or many years later. Aging is the primary risk factor for cataracts, but other factors are also involved. Nearly everyone who lives long enough will develop cataracts to some extent. Some people develop cataracts during their middle-aged years (40s and 50s), but these cataracts tend to be very small. It is after age 60 that cataracts are most likely to affect vision. Nearly one half of people age 75 and older have cataracts. Women face a higher risk than men. Cataracts tend to run in families. In the United States, African Americans have nearly twice the risk of developing cataracts as white people. Hispanic Americans are also at increased risk for cataracts. In fact, cataracts are the leading cause of visual impairment among Hispanics. Diabetes (type 1 or type 2) poses a very high risk for cataracts and the likelihood of developing them at a younger age. Cataract development is significantly related to high levels of blood sugar (hyperglycemia). (Cataract prevention is one of the many important benefits of controlling blood sugar.) Obesity, which is associated with diabetes type 2, and high blood pressure are also risk factors for cataracts. Long-term use of oral corticosteroids (commonly called steroids) increases the risk for cataracts. Medical conditions that use oral steroid medications for treatment include autoimmune diseases such as rheumatoid arthritis and systemic lupus erythematosus. Other types of medications (such as statin drugs) may also pose a risk. Radiation therapy for head and neck cancer is a risk factor for cataracts. Eye injuries and certain types of eye surgeries (such as trabeculectomy for glaucoma) increase the risk for cataracts. Uveitis is an inflammatory eye condition that is a significant risk factor for cataracts. Nearsightedness (myopia) may be associated with increased risk for certain specific types of cataracts although it is uncertain whether it increases the general risk for age-related cataracts. Myopia does increase the risk for complications from cataract surgery. Excessive exposure to ultraviolet B (UVB) radiation from sunlight increases the risk for cataracts. The risk may be highest among those who have significant sun exposure at a young age. People whose jobs expose them to sunlight for prolonged periods are also at increased risk. Sunglasses or a wide-brimmed hat can help block the harmful effects of ultraviolet (UV) radiation. Protective sunglasses do not have to be expensive but it is important that they block 99% to 100% of UV light. Polarized, mirror-coated, or blue light-blocking lenses do not protect against UV radiation. Smoking a pack of cigarettes every day doubles the risk of developing cataracts. Smokers are at particular risk for cataracts located in the nuclear portion of the lens. Quitting smoking can help reduce the risk, although the risk will remain higher in former smokers than those who never smoked. Chronic heavy drinkers are at high risk for a number of eye disorders, including cataracts. Although it is not clear how much of a role nutrition plays in age-related cataracts, there is evidence that antioxidant-rich fruits and vegetables may offer some protection. The antioxidants most studied for cataract prevention are lutein and zeaxanthin, which are a type of antioxidants called carotenoids. Lutein and zeaxanthin are found in the lens. Some research suggests that foods that contain these carotenoids, such as green leafy vegetables, may help slow the aging process in the eye and protect against cataracts. However, studies indicate that dietary supplements that contain lutein and zeaxanthin, or antioxidant vitamins, such as vitamin C or E, do not reduce the risks for cataract formation. Antioxidants found in food, not supplements, appear to offer the best protection. Kale, collard greens, and spinach are the main food sources for lutein and zeaxanthin. During the early stages, cataracts have little effect on vision. People who have small cataracts can often see well enough around the clouded areas to function normally. But as a cataract grows larger and increasingly clouds the lens, it can interfere greatly with daily activities such as reading and driving. Cloudy, blurry, or dim, vision. You may feel as if you are seeing objects through a fog or veil. It can become difficult to see clearly even in brightly lit environments, and may be extremely difficult to see at night. Glare, halos, and sensitivity to bright lights. You may notice halos of light around streetlights or the headlights of oncoming cars, which can make it difficult or impossible to drive at night. Muted or faded colors. Images may take on a yellowish tint as color vibrancy diminishes. Reduced contrast. Reading may become difficult because of a reduced contrast between letters and their background. Double vision or "ghost" images in a single eye. A cataract can cause you to see multiple images or to see faint shadow copies of an image. Frequent change in corrective lenses. As the cataract grows, it can affect both near and far vision (and even cause temporary improvement). You may find that you often need new prescriptions for eyeglasses or contact lenses. Symptoms may vary depending on the part of the lens that is affected. For example, posterior subcapsular cataracts, which cloud the center of the back of the lens, can make it difficult to read and to see in bright light when the pupil of the eye gets smaller. Cortical cataracts can worsen problems with glare. Nuclear cataracts, because of their brownish tint, typically cause problems seeing colors correctly, although this may not be detectable until the first eye has cataract surgery, causing the brownish tint in the un-operated eye to become obvious. 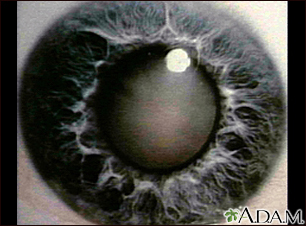 This photograph shows a cloudy white lens (cataract) seen through the pupil. Cataracts are a leading cause of decreased vision in older individuals, but children may have congenital cataracts. With new surgical techniques, the cataract can be removed, a new lens implanted, and the person can usually return home the same day. Either an ophthalmologist or an optometrist can examine people for cataracts, but only ophthalmologists are qualified to treat cataracts. An ophthalmologist is a medical doctor (M.D. or D.O.) who specializes in the medical and surgical care of the eye. An optometrist is a doctor of optometry (O.D.) who diagnoses eye diseases and prescribes corrective lenses but does not perform surgery. All of these tests are quick and painless. From a specified distance, usually 20 feet, a person reads the letters using one eye at a time. If a person can read down to the small letters on the line marked 20 feet, then vision is 20/20 (normal vision). If a person can read only down through the line marked 40 feet, vision is 20/40; that is, from 20 feet the person can read what someone with normal vision can read from 40 feet. If the large letters on the line marked 200 feet cannot be read with the better eye, even with glasses, the person is considered legally blind. 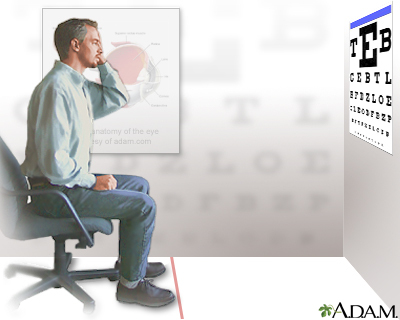 The visual acuity test can be performed in many different ways. It is a quick way to detect vision problems and is frequently used in schools or for mass screening. Ophthalmoscopy is performed to examine the back part of the eye (fundus), which includes the retina, optic nerve, and blood vessels. This test can help detect cataracts as well as other eye diseases such as glaucoma. The eye doctor may give you eye drops before the test to dilate (widen) the pupils of your eyes. The eye doctor uses a handheld device (ophthalmoscope) to shine a beam of light through the pupil. The eye doctor wears a head lamp (like a miner's light) and a handheld lens to view the eye. The doctor has you rest your chin and forehead on a support to keep the head steady, and then uses a special microscope and vertical beam of light to examine the eye. Tonometry measures the pressure inside your eye. It is used to find out if glaucoma is contributing to your symptoms, although glaucoma rarely causes visual symptoms unless it is advanced. The clinician will first give you anesthetic drops to numb your eye. Next, a small device is gently pressed against your eye to measure intra-ocular (inside the eye) pressure. Eye pressure may also be evaluated in different ways such as with a hand-held electronic device or a gentle puff of air to indent the eye. A chart similar to the Snellen chart is used to test contrast sensitivity. The chart has the same size letters, but in different contrasts with the background. Glare sensitivity is tested by having the patient read a chart twice, with and without bright lights shining into the eyes. Potential acuity evaluates the eye's acute vision center by testing macular function. It can help the ophthalmologist determine the expected improvement from cataract surgery. The corneal endothelium, a layer of cells lining the inside of the cornea, is sensitive to normal surgical trauma and should be evaluated before any intraocular operation. People with other eye disorders may need other pre-operative tests. Surgery is the only cure for cataracts, but it is almost never an emergency. Most cataracts cause no other health problems besides reducing a person's ability to see. Usually, there is no harm in delaying surgery, except for an increased risk of injury from falls or unsafe driving. Sometimes delaying surgery will cause a moderate (easy to perform surgery on) cataract to progress to an advanced (difficult to perform surgery on) cataract. People usually have plenty of time to carefully consider options and discuss them with an ophthalmologist. Some cataracts develop to a certain point and then stop. Even if a cataract does progress, it may be years before it interferes with vision. Your doctor may recommend "watchful waiting" and delaying surgery while monitoring your condition on an on-going basis. It is very rare for people to need immediate cataract surgery. Cataract removal is one of the most common types of eye surgery performed in the United States, especially for people over age 65. In the past, cataract surgery was not performed until the cataract had become well developed (ripe). Newer techniques, however, have made it safer and even more efficient to operate in earlier stages. Cataract surgery improves vision in up to 95% of people and prevents millions of people from going blind. Nevertheless, some cataract surgeries that are performed may be unnecessary, or at least, premature. In general, even if cataracts are diagnosed, the decision to remove them should be based on the person's own perception of vision difficulties and the effect of vision loss on normal activity or independent living. However, since progression is often gradual and subtle, it may not be apparent how they have affected vision and activities of daily life. Those considering cataract surgery should be made fully aware of all the potential risks and benefits of surgery. Is my cataract surgery an emergency? Are the cataracts the only cause of my poor vision? Do I have other eye diseases that might complicate surgery or reduce my benefit? Do I have other health problems that might further complicate eye surgery? What type of lens will you implant? What type of procedure will you use? What are my chances of having poorer vision after surgery? How well should I ultimately be able to see out of the operated eye? What precautions should I take during the healing process? How long will it take to achieve my best eyesight? Will I have to wear glasses or contact lenses after surgery? When will I get my final eyeglass prescription? How soon after surgery will I be able to see well enough to go back to work? Drive a car? Return to full activity? If you have further questions or doubts about the procedure, you may want to get a second opinion from another ophthalmologist. If a person has a cataract in a second eye, the issues for decision-making are the same as for the first eye. In general, surgery for a second cataract is usually performed at least 1 to 2 weeks after surgery for the first eye. Although uncommon, in some circumstances surgery may be performed on both eyes at the same time. For people who have moderate to severe glaucoma, the traditional approach has been combination cataract-glaucoma surgery (phacotrabeculectomy). This combination surgery involves performing both trabeculectomy (glaucoma filtration surgery) and phacoemulsification (cataract extraction). Newer techniques and devices are being developed for MIGS (minimally invasive glaucoma surgery or micro-invasive glaucoma surgery), most of which can be combined with cataract surgery. They have the advantages of generally being safer and more effective than trabeculectomy. For example, the iStent is a tiny tube that is implanted in the eye during cataract surgery. The stent helps improve the outflow of aqueous humor which is a fluid, and thereby lower intraocular pressure (IOP) in the eye. For infants born with cataracts in one eye, the American Academy of Ophthalmology recommends surgery as soon as possible, by age 4 months or ideally even earlier. The procedure is followed by contact lens correction and patching of the unaffected eye. Although this approach is successful in many cases, some children still become blind in the affected eye. There is also a high risk for glaucoma after surgery. For infants with cataracts in both eyes, surgery is not always an option. Sometimes surgery may be performed sequentially, with the second eye operated on a few days after the first. Phacoemulsification appears to pose a much higher risk for secondary cataracts than standard lens removal. Intraocular lens replacement is now standard treatment for children age 2 years and older. A general physical examination for people with medical problems, such as diabetes. Diabetes can cause damage to the blood vessels of the retina, a condition called diabetic retinopathy. If you have diabetes, discuss with your doctor how your blood sugar level may affect the surgery. A review of all your medications. In particular, men who take tamsulosin (Flomax), or similar drugs for prostate problems, require special surgical techniques to prevent complications. A painless test to measure the length of the eye and determine the type of replacement lens that will be needed after the operation. Topical antibiotics (for example, ofloxacin or ciprofloxacin), which may be applied for a day or two before surgery to protect against postoperative infection. Topical anesthesia involves topical drops that numb the surface of the eye, and a tiny amount of anesthetic that is injected directly into the eye at the beginning of the actual surgery. 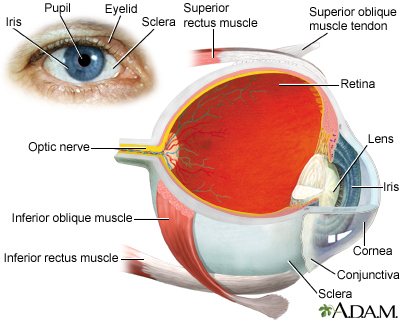 Nothing specifically blocks the nerves of the muscles that move the eye. Sedation in the form of an injection through a vein or occasionally as a pill, will help the patient hold the eye still. In local anesthesia, a sedative injection through a vein is given, followed by injections of anesthetic around the eye to numb the eye and block the nerves to the eye muscles. General anesthesia is the method of choice for babies, children, and adults who are not able to cooperate. Phacoemulsification (phaco means lens; emulsification means to liquefy) is the most common cataract removal method in the United States. The surgeon makes a small incision at the edge of the cornea. The phacoemulsification probe is inserted into the eye. This probe has a hollow vibrating needle attached to a vacuum source. The needle is surrounded by a silicone sleeve. Cataract fragments are drawn to the tip of the needle where ultrasonic vibrations break them up so they can be sucked out through the core of the needle. To keep the eye inflated during this process, irrigation fluid flows around the needle under the silicone sleeve and back into the eye. An artificial intraocular lens is implanted in place of the natural lens. Click on the icon to see images of a cataract surgery. Most phacoemulsification procedures take about 15 minutes, and the patient is usually out of the operating room in under an hour. There is little discomfort afterward, and complete visual recovery usually occurs within 1 to 5 days. Phacoemulsification is sometimes combined with glaucoma surgical procedures, for people who have both glaucoma and cataracts. Extracapsular cataract extraction, the precursor to phacoemulsification, is now generally used only in people who have an extremely hard lens. The surgeon makes a larger incision at the edge of the cornea. The hard center (nucleus) of the lens is loosened from the rest of the cataract. The nucleus is removed in one piece through the larger incision. An irrigation/aspiration probe (similar to a phacoemulsification probe but without the ultrasound) is used to remove the remaining, softer parts (cortex) of the cataract. Newer technologies have been developed so that the incisions used in cataract surgery can be made with a femtosecond laser rather than a blade. (The femtosecond laser was originally developed to make the flap in LASIK surgery. It has since been modified to be useful in cataract surgery.) The laser can also soften the lens nucleus so that phacoemulsification will be easier. It still remains to be seen whether laser cataract surgery presents clear advantages over more conventional methods. Regardless of which technique is used to remove the cataract, a lens implant (IOL) is almost always inserted to correct the optics of the eye, which now has no natural lens. With the clouded lens removed, the eye cannot focus a sharp image on the retina and is functionally blind at all distances. A replacement lens is therefore needed. An artificial lens, known as an intraocular lens (IOL), is usually inserted immediately after the cataract is extracted. Most IOLs are made out of acrylic, although other materials, such as silicon, are also used. These have been used since the 1980's. They can correct either distance or near vision, but not both. Glasses will be needed for the range that is not corrected by the IOL; for example, if the eye can see at distance with the IOL, then glasses will be needed for reading. These have been available since about 2004 and can correct both nearsightedness and farsightedness. However, contrast may be reduced, and some patients experience glare and halos, particularly at night. These were FDA-approved in 1998 but did not see widespread use until about 2005. These lenses are designed to correct pre-existing astigmatism, as well as nearsightedness and farsightedness in patients having cataract surgery. The patient and the doctor must choose the IOL based on specific visual needs. Many people also need eyeglasses after cataract surgery for reading or to correct astigmatism. Swelling and inflammation. A small amount of inflammation in the area where the cataract surgery took place is common for a day or two after the surgery. Swelling and inflammation can occur elsewhere in the eye; although the risk is about 1%, this complication can be particularly harmful for people with a prior history of uveitis (chronic inflammation in the eye, which can be due to various medical conditions). Retinal detachment. 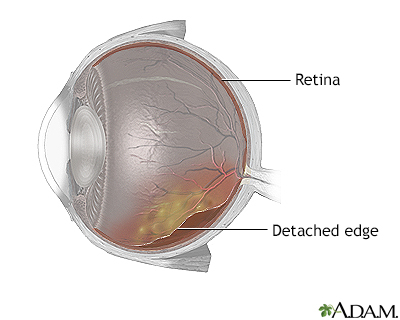 In rare cases, the retina at the rear of the eye can become detached from the inside of the eye. If this happens, it needs to be treated promptly. Infection. This is very rare (0.2%) but may be serious if it does develop. Posterior capsular opacification. This condition is also known as a secondary cataract that involves clouding of the lens capsule, and is one of the more common complications of cataract surgery. Rapid onset, usually seen on the first day after surgery, with high pressures; this is a response to one of the agents used during cataract surgery; treatment rapidly lowers the pressure and it is usually completely resolved within a week. Elevated pressure that results from the corticosteroid drops used during the post-operative period; this occurs in "steroid responders" and goes away when the drops are stopped. A more gradual increase in pressure that occurs over weeks to months; this is more likely to develop into true glaucoma, but is rare. Glaucoma is a disorder of the optic nerve that is usually marked by increased fluid pressure inside the eye. 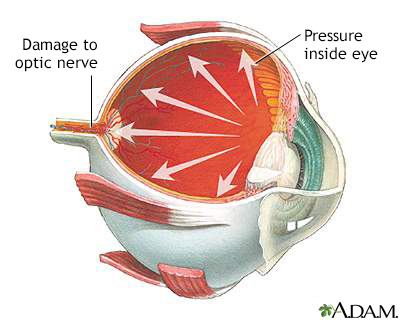 The increased pressure causes compression of the retina and the optic nerve which can eventually lead to nerve damage. Without treatment, glaucoma can cause partial vision loss, with blindness as a possible eventual outcome. A topical antibiotic for protection against infection. Corticosteroid eye drops or ointments to reduce swelling. They may pose a risk for increased pressure in the eye. Nonsteroidal anti-inflammatory drugs (NSAIDs), such as diclofenac, ketorolac, naproxen, and voltaren. NSAIDs also reduce swelling and do not have the same risks (increased eye pressure) as steroids. Newer NSAIDs approved to treat pain and swelling after cataract surgery include bromfenac (Prolensa, Xibrom) and nepafenac (Ilevro, Nevanac). Some ophthalmologists may inject antibiotics and corticosteroids into the eye at the end of the surgery, reducing the number of medications that must be used during the post-operative period. Diabetes. Cataract extraction can pose a high risk for the development or worsening of retinopathy, a known eye complication of diabetes. Taken tamsulosin (Flomax) or other alpha-1 blocker drugs. Tamsulosin is a muscle relaxant prescribed for treatment of several urinary conditions, including benign prostatic hyperplasia (BPH). Tamsulosin may cause intraoperative floppy iris syndrome (IFIS), a loss of muscle tone in the iris that can cause complications during eye surgery. Problems have been reported both for people who were taking the drug at the time of surgery as well as those who had stopped taking the drug for several weeks or months before surgery. Men who have taken tamsulosin or similar drugs should inform their eye surgeon. The surgeon may need to use different techniques to minimize the risk of complications from IFIS. You will probably leave the surgical site within about an hour after surgery. Cataract surgery almost never requires an overnight hospital stay. You will need someone to drive you home and stay with you for a few days until your vision improves. You will be examined a day or two after surgery and then during the following month. Additional visits occur as necessary. Vision has usually recovered by day 5, often sooner. Rarely the vision may remain blurry for up to 6 weeks. If it takes longer than that, there may be complications. When your doctor decides the condition has stabilized, you will receive a final prescription for glasses or contacts. The ophthalmologist usually tapes a bandage and a rigid eye shield over the eye at the end of surgery. Depending on the type of anesthesia, even this may not be necessary. Most surgeons don't require any bandages after the first post-operative visit except to wear just the rigid eye shield at night for the first week. Use dark glasses whenever in bright sunlight. Avoid swimming and exposure to dust and wind. Do not bend over unnecessarily for at least one day following surgery. Refrain from jumping, running, heavy lifting, and any other strenuous exercise for a few weeks after surgery. About 15% of people who have cataract surgery develop a secondary or "after-cataract" called posterior capsular opacification. Posterior capsular opacification is a clouding of the lens capsule that was intentionally left behind, (it is used to hold the IOL in place) when the original cataract was removed. It generally occurs because some cells of the natural lens remain after surgery and can regrow onto the capsule. The standard treatment for posterior capsular opacification is a type of laser surgery known as a YAG capsulotomy. (Capsulotomy means making an opening in the capsule, and YAG is an abbreviation of yttrium aluminum garnet, the laser most often used for this procedure.) This is an outpatient procedure that involves no incision and can help improve vision and reduce glare. The Yag laser has a chinrest and forehead bar for the patient, similar to what is used for a slit lamp exam. Some surgeons use a contact lens to help aim the laser, but if not, nothing will touch the eye. There is no pain and the procedure is usually complete within a minute or two. After the procedure, the patient may remain in the doctor's office for an hour to make sure that pressure in the eye is not elevated. The doctor will usually prescribe anti-inflammatory eyedrops for the person to take at home. Most people will find that their vision improves within a day. An eye examination for any complications should follow within 2 weeks. YAG laser capsulotomy is generally a safe procedure. Serious complications are rare, but can include retinal detachment. Abell RG, Darian-Smith E, Kan JB, Allen PL, Ewe SY, Vote BJ. Femtosecond laser-assisted cataract surgery versus standard phacoemulsification cataract surgery: outcomes and safety in more than 4000 cases at a single center. J Cataract Refract Surg. 2015;41(1):47-52. PMID: 25466483 www.ncbi.nlm.nih.gov/pubmed/25466483. Allen D. Phacoemulsification. In: Yanoff M, Duker JS, eds. Ophthalmology. 4th ed. Philadelphia, PA: Elsevier Saunders; 2014:chap 5.7. Allman KG. Anesthesia for cataract surgery. In: Yanoff M, Duker JS, eds. Ophthalmology. 4th ed. Philadelphia, PA: Elsevier Saunders; 2014:chap 5.6. Chiu CS. 2013 update on the management of posterior capsular rupture during cataract surgery. Curr Opin Ophthalmol. 2014;25(1):26-34. PMID: 24310374 www.ncbi.nlm.nih.gov/pubmed/24310374. Christen WG, Glynn RJ, Gaziano JM, et al. Age-related cataract in men in the selenium and vitamin e cancer prevention trial eye endpoints study: a randomized clinical trial. JAMA Ophthalmol. 2015;133(1):17-24. PMID: 25232809 www.ncbi.nlm.nih.gov/pubmed/25232809. DCCT/EDIC Research Group; Aiello LP, Sun W, et al. Intensive diabetes therapy and ocular surgery in type 1 diabetes. N Engl J Med. 2015;372(18):1722-1733. PMID: 25923552 www.ncbi.nlm.nih.gov/pubmed/25923552. Hoffman RS. Cataracts. In: Ferri FF, ed. Ferri's Clinical Advisor 2018. Philadelphia, PA: Elsevier; 2018:259-259. Howes FW. Manual cataract extraction. In: Yanoff M, Duker JS, eds. Ophthalmology. 4th ed. Philadelphia, PA: Elsevier Saunders; 2014:chap 5.10. Howes FW. Patient workup for cataract surgery. In: Yanoff M, Duker JS, eds. Ophthalmology. 4th ed. Philadelphia, PA: Elsevier Saunders; 2014:chap 5.3. Kessel L, Tendal B, Jørgensen KJ, et al. Post-cataract prevention of inflammation and macular edema by steroid and nonsteroidal anti-inflammatory eye drops: a systematic review. Ophthalmology. 2014;121(10):1915-1924. PMID: 24935281 www.ncbi.nlm.nih.gov/pubmed/24935281. Kohnen T, Ostovic M, Wang L, Friedman NJ, Koch DD. Complications of cataract surgery. In: Yanoff M, Duker JS, eds. Ophthalmology. 4th ed. Philadelphia, PA: Elsevier Saunders; 2014:chap 5.14. Lindblad BE, Håkansson N, Wolk A. Smoking cessation and the risk of cataract: a prospective cohort study of cataract extraction among men. JAMA Ophthalmol. 2014;132(3):253-257. PMID: 24385206 www.ncbi.nlm.nih.gov/pubmed/24385206. Lundström M. Outcomes of cataract surgery. In: Yanoff M, Duker JS, eds. Ophthalmology. 4th ed. Philadelphia, PA: Elsevier Saunders; 2014:chap 5.15. Olson RJ, Braga-Mele R, Chen SH, et al. Cataract in the adult eye preferred practice pattern. Ophthalmology. 2017;124(2):P1-P119. PMID: 27745902 www.ncbi.nlm.nih.gov/pubmed/27745902. Packer M. Small incision and femtosecond laser cataract surgery. In: Yanoff M, Duker JS, eds. Ophthalmology. 4th ed. Philadelphia, PA: Elsevier Saunders; 2014:chap 5.9. Rautiainen S, Lindblad BE, Morgenstern R, Wolk A. Total antioxidant capacity of the diet and risk of age-related cataract: a population-based prospective cohort of women. JAMA Ophthalmol. 2014;132(3):247-252. PMID: 24370844 www.ncbi.nlm.nih.gov/pubmed/24370844. Zhang ML, Hirunyachote P, Jampel H. Combined surgery versus cataract surgery alone for eyes with cataract and glaucoma. Cochrane Database Syst Rev. 2015;(7):CD008671. PMID: 26171900 www.ncbi.nlm.nih.gov/pubmed/26171900. Reviewed By: Christopher L. Haupert, MD, ophthalmologist in West Des Moines, IA. Review provided by VeriMed Healthcare Network. Also reviewed by David Zieve, MD, MHA, Medical Director, Brenda Conaway, Editorial Director, and the A.D.A.M. Editorial team.